In this three-hour small group Modern Japanese History Tour, you’ll be guided by an English-speaking guide as you visit the historic landmarks with relics of the recent WWII. In this three-hour small group Modern Japanese History Tour, you’ll be guided by an English-speaking guide as you visit the historic landmarks with relics of WWII. Guests will visit to Showa-kan Museum, which recreates the scene and showcases the daily necessities of the people and soldiers of World War II. 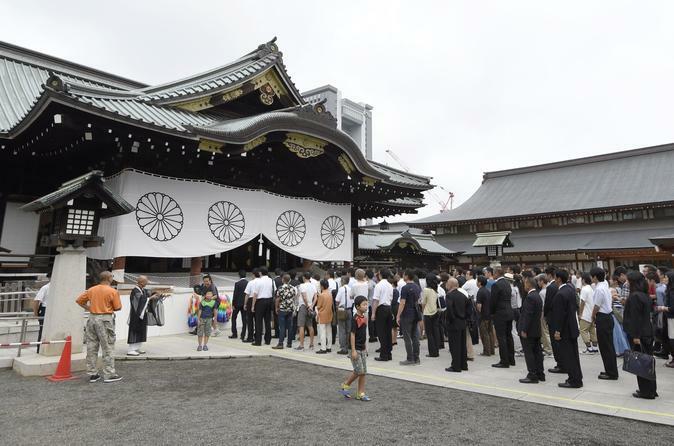 Guests will also pay a visit to Yasukuni Shrine, which commemorates 2.5 million of Japan’s war dead since 1869. Learn about the history that surrounds the shrine before heading to Yushukan Shrine, the military and war museum dedicated to the souls of soldiers who died fighting for their country. In this tour, guests will learn how the Japanese people commemorate and pay their respects to those who have perished from war, the issues that civilians faced during WWII such as starvation, how Japanese soldiers felt and behaved during the war, learn why kamikaze (also known as tokotai) was so prevalent and how the soldiers told their family members before their inevitable fates.